The Boeseman Croaker is a member of the perciformes (perch-like) family of fishes which is distributed throughout Thailand ,Vietnam and Sumatra. The Boeseman Croaker in Thailand is found in various river systems including the Mekong River, Ban Pakong River and Maeklong River. The streamlined Boeseman Croaker inhabits deep pools of fast flowing rivers where it actively hunts aquatic invertebrates,insects and small fishes. The sleek elongated body of the Boeseman Croaker is covered in minute silver to grey/brown scaling with large dorsal and extended adipose fin. A distinct lateral line can be observed on the Boeseman Croaker that runs down its entire body length. This species has a small caudal fin (tail)which often displays a grey to orange colouration. The Boeseman Croaker has a pronounced forehead as is common in many perch species and has a sleek torpedo-like body shape similar to that of a Zander. The Boeseman Croaker has large predatory eyes coupled with a set of large pronounced lips which it uses to grasp unsuspecting prey fish. The Boeseman Croaker in Thailand has been observed during the dry season at the Mekong River when approaching the spawning season to loudly and continuously audibly croak. This curious phenomenon is believed to be part of a courtship ritual aimed at inducing the females to engage in spawning. 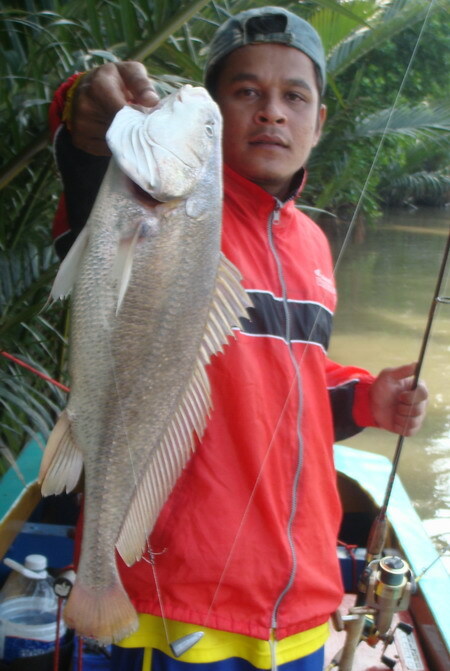 The Boeseman Croaker in Thailand reaches a maximum length of 1m with weights reaching 18kg’s.